Experience the art of relaxation. Combining exceptional comfort with superior materials and meticulous craftsmanship, the 671 stool is designed for comfort. When paired with the luxurious 670 Lounge Chair, it brings instant vintage glamour and a seating experience unlike any other. Like the chair, the stool has a distinctive wooden frame and soft leather cushioning, which is just the thing for weary feet. Versatile and comfortable enough to also be used as a seat, the stool is a handy addition to your home. Upholstered in premium aniline leather, the chair is available in brown, sand, red, camel, white, cream, dark brown and black. 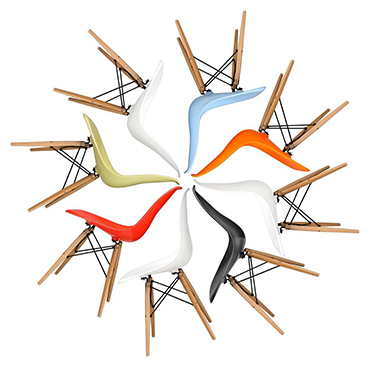 When Eames created the Lounge Chair and Stool back in 1956 there was nothing else like it. There still isn't. The designs set new standards in how lounge furniture should look and function, and these are still followed to this day. The chair and stool were inspired by 19th century English club chairs and you can see this influence in the luxurious materials and distinctive form. But Eames modernized the style and maximised the comfort. It's this increased functionality that has contributed to the Eames Lounge series enduring popularity and iconic status.